You may recall that I had the pleasure of paying a visit upon Tamzin Griffin recently, the last tenant to depart from 27 Fournier St, the exceptional eighteenth century silk merchants’ house that was sold recently. I never expected to go back, but then I had a call to meet Anna Skrine who was instrumental in saving the house when she worked for the Spitalfields Trust and who has been its custodian ever since. It was Anna’s last day clearing out the final bits and pieces of crockery and glass, putting them in boxes that she was going to place on Fournier St later, to allow people to help themselves. Two weeks ago, there was still a little furniture left but now I was surprised to find the place entirely bare and the house sits empty this weekend before the new owner arrives to claim it on Monday morning. A direct woman with an attractive bright energy, Anna fished two old cups from boxes and made us tea with a few leaves straight in the cups. Then we walked upstairs with cushions tucked under our arms and found a corner of the expansive first floor drawing room to settle upon the polished boards in a pool of February sunlight. Thirty years ago, Anna worked as an assistant at the Spitalfields Historic Buildings Trust, founded by Douglas Blain, Mark Girouard and Dan Cruickshank to save the old houses that were under threat. As well as secretarial duties, Anna organised a petition save the buildings in Cheshire St and before long her role evolved into direct action too. “I was the one who said, ‘The bulldozers are coming!’ so we all piled into the Board School in Spital Sq.” volunteered Anna enthusiastically, describing how she and other members of the trust staged a sit-in, occupying the place with sleeping bags in winter, locking themselves into the condemned building to draw attention to its importance. The story became front page news and the building was saved. But most importantly, this event became the tipping point when national opinion altered and the preservation of old buildings became a greater priority in the face of the thoughtless demolition and redevelopment that had become the rule. It was due to the actions of these few pioneering individuals that the historic houses survived to be cherished in Spitalfields today. Talking with Anna, I began to get a sense of the excitement of that moment when there was so much potential to reclaim the beauty of these neglected edifices that went unappreciated, and a vigorous social life engendered by this shared enterprise undertaken by a colourful bunch of personalities. “Dennis Severs‘ Christmas parties at his house in Folgate St were the most beautiful, magical events that I ever knew. It wasn’t only how it looked which was magic – but also the smells, because he used to clean the floor with lavender, so you had that mixed in with the other wonderful Christmassy smells of cinnamon and oranges with cloves. He was a master at it. It was just so beautiful.” remembered Anna with pleasure. Anna’s sister Fiona bought an eighteenth century silk merchant’s house at 14 Wilkes St. “Only two or three houses in the street were inhabited at that time and the locals thought we were completely mad. We lived in it and did most of the work we could to renovate it ourselves,” said Anna. Anna looked around the magnificent panelled room, absorbing the familiar space and reminding herself of its place in her life, because, although she is distinguished by her placid composure, it was apparent that this was somewhere for which Anna has great emotional attachment. Anna’s thoughts flitted around the neighbouring streets as she described how Jim and Douglas explored the house of a bird dealer in Hanbury St that had a floor entirely full of exotic birds in cages and a cellar full of guano, and how they were also the first to enter the abandoned synagogue at 19 Princelet St, discovering the locked top floor where the occupant Mr Rodinsky had departed never to return, leaving his cereal bowl on the table. 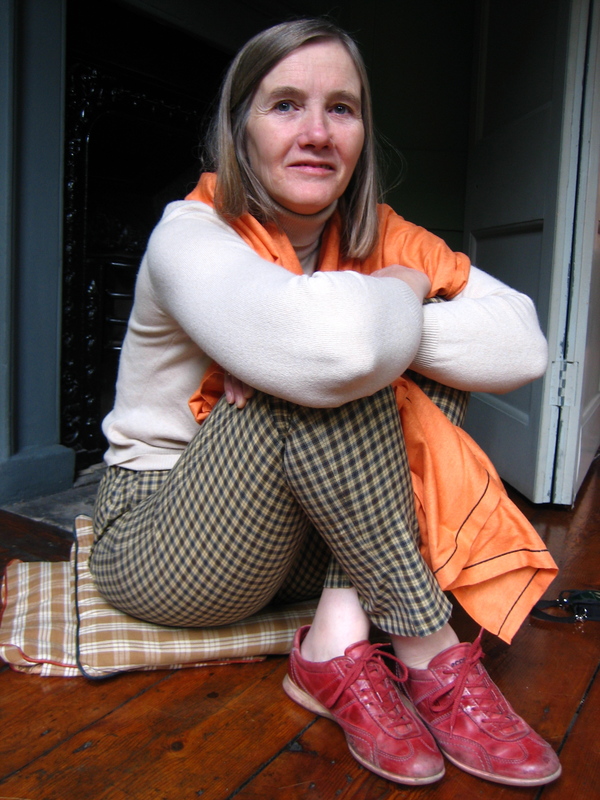 “I lived in this house for a while as caretaker while the builders were working,” said Anna, returning the conversation to 27 Fournier St, before explaining that she left to live in Wales when she had her first child and subsequently moved to Ireland where she resides today. Through all this time, Anna has continued as custodian of 27 Fournier St, managing the tenants, fulfilling Henry Barlow’s notion that the house should be let to young artists and actors at rents they could afford. She talked fondly of those who became friends, including Marianna Kennedy, the very first tenant, who lives today at the other end of Fournier St. Now, I was meeting Anna on the final day of her duties as custodian after a quarter of a century and it was my privilege to be party to her emotions at this moment. As we descended the crooked staircase, Anna invited me to help myself to any of the things that were left behind. But – as I abandoned deliberating over old cups – I realised that the real gift had been the opportunity to meet Anna herself, the worthy custodian of 27 Fournier St, and hear her evocations of those passionate young people, and the brave lively events that incarnated the moment when Spitalfields was saved. 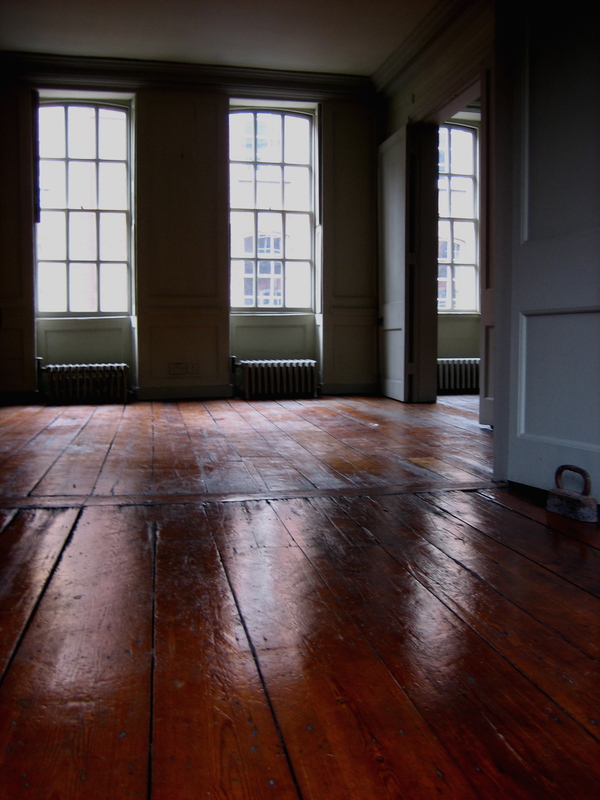 I keep coming back to this entry to look at your photo of the floor, musing on the feet that have walked there: gowns and kid slippers sweeping past, children’s boots clattering after some dropped toy, the halting steps of an elder, punctuated by the determined thunk of a cane. Perhaps the children’s boots and elder’s cane belonged to the same person, a life span spent going in and out of that sturdy front door. So many lives echoing down the centuries. I am glad that the floor boards will echo still.